And what a strange year it has been. In many ways it has been a tough one and yet in others a very wonderful and rewarding one. As the year began there were so many changes I was facing that I wasn't really sure what I wanted for the most part. I was in really a dark spot in my life continuing from late 2014, the worst in nearly 20 years. But I refused to give in to the darkness. Knock me down and I will fight my way back up and come back even stronger. So I learned to accept the changes forced on me and used the lessons learned with the help of a bright star to light my new path. Many things I thought I would be doing had no meaning anymore but they were replaced with new dreams as the year moved on but lets focus on where I was in January. Just two big goals and beyond that nothing much. Qualify for Boston and finish Western States. So that made it really easy to plan the first 6 months of the year, or at least I thought as you will see. January started off with just some awesome training. I was really suprised at how quickly I had gotten back into shape after the 2 month hamstring injury in the 2nd half of last year. The workouts with Laura were amazing and she was (and is) such a great motivator and cheerleader and refused to let me get down. So with things going well I decided to return to the Ocean Isle Beach Run for Food Half Marathon for a test. As usual it turned out to be a cold windy day at the beach but despite slowing the last few miles I ran a decent 1:45:17 and won my age group. a great confidence boost going into the final 2 months of training for the BQ attempt. February was a tough month with lots of training in cold and icy conditions but the training continued to go well. But I had some freaky things happen involving a fall out of my car and off a treadmill among others that started some issues with my upper hamstring not to mention some excrutiating pain from some cracked ribs. But somehow I continued to work. 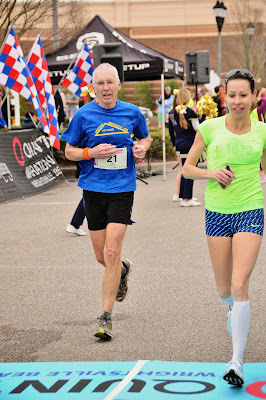 And I decided to race the sweetheart 5k in Rocky Mount. turned out to be a surprisingly hilly course but I ran a strong even paced race in 22:18 and a 2nd place AG award. Afterwards the hamstring issue was giving me more problems and things were getting iffy. Then just as March arrived and just a few weeks to go I was in trouble. I had been seeing John Stiner at Stiner Massage every two weeks since the injury last Sept but I felt I had really screwed up. 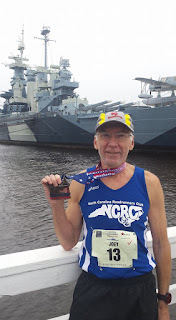 I called him and made an emergency appointment which I had to drive to in a snow storm but he was able to patch me up and with a couple of days rest I was able to run nearly pain free with a week to go before the race. I decided to forgo my plans to go for a pr and just try and get the BQ at the Wrightsville Beach Marathon and hope the body held up. Tada ! Success. Not the sub 3:40 I was hoping for but the 3:48 was good enough. And it never would have happened if Laura hadn't been there helping me train and then being there for me in the last 5.5 miles of the race. You can get the whole story here at this link. With the BQ taken care of it was now time to switch focus and prepare for Western States. An easy recovery week and then I begin returning to some trail running and adding in more hills. In the middle of April I had the Run the Rock 50k in raven rock State park. IT was a warm muggy day but I still ran and felt pretty good all day and enjoyed about 11 miles of it with Kara but I also had two bad stumbles which did even more damage to my upper hamstring/lower glute area. I needed some time off but I was so focused on wanting to be ready for WS so i pushed on. And then it just quit on me. By the end of the month after another trail run in Umstead where I had another fall I was in too much pain and the leg just wouldn't go. I was forced to take time off and hope for quick healing. Long story short, I had some serious damage to the area and the healing didn't come quick. I missed the entire month of May and Itried a couple of test runs but barely made it 1/4 mile before the pain was telling me to walk back home. Then June came and still the same. A test run two weeks before WS was another total fail so I didn't even try again. My dream of finishing WS was gone but I went out there anyway and gave it my best shot which wasn't very much of one limping and falling and re-injuring myself with a dnf at 16 miles. July was just another month of rest and healing but finally in the last week I went for a test run walk and made it a mile pain free and within two weeks I was able to run 4 miles and hope for a future in running was returning. It's a good thing I didn't have many plans for the Fall. I had signed up for the Columbus Marathon in October with hopes of improving on my BQ time but other than that the remainder of the year was wide open. August was just easy running as I begin to rebuild. I was pretty happy with how quickly my pace returned but the endurance needed some work. Finally in September I felt I was ready to resume the Fun Fridays with Laura. I think I had missed that more than anything during the layoff for the injury. I was a bit worried if I could run fast enough and not hurt myself but the first one went great just like always and we had a most wonderful time. I signed up for the Holden Beach Half Marathon but knew it would be a slow one as I had not quite returned to racing shape and no real long runs yet. To add to it the day turned out to be nasty hot and humid and windy ! It turned into a death march and my slowest half in 38 years of running but at least I didn't hurt myself. In October I decided to skip traveling to Columbus because I knew I wasn't ready to race a quality marathon. Instead I opted to return to Danville Va and run a half marathon. Wow, what a difference from the month before. Instead of 78 and humid at the start it was 29F ! I felt great and ran a 1:43 :15. In November I normally would be either going to Mountain Masochist or OBX. This year was suppose to a 10th Anniversary run but after the experience after last years race I just couldn't see myself returning and there was nothing to celebrate. 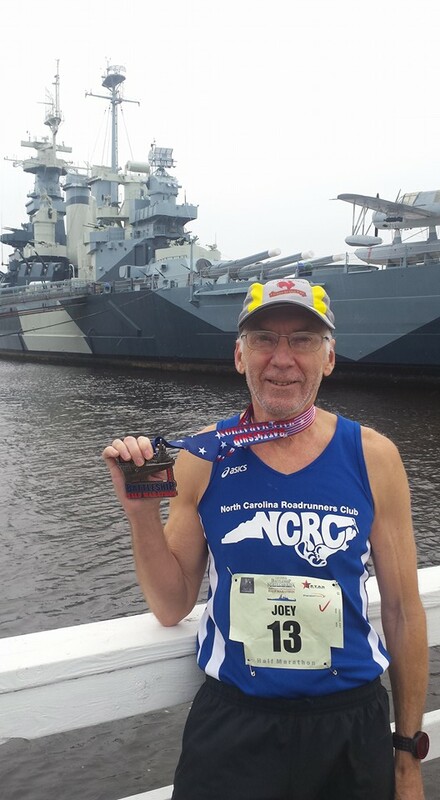 So instead I chose to run the Battleship half marathon in Wilmington, a race I last ran back in 1999 ! I had another good race on a dreary cool day in 1:44 and was quite pleased with the consistent effort. I ended the month with my 12th consecutive Derby 50k. I had hoped it would be a pr attempt but I still didn't have the endurance to match the leg speed just yet and a freaky warm day that had me running shirtless guaranteed a slow day so I just made the most of it and had some fun. And that concludes the report for 2015. December had just been a training month to begin getting ready for next year but that is another post. Thank you for reading. I'd say it was a great year. You learned what you are made of and how tough you are. (And you got to see the Doobies and Greg Alman. Lets not discount that.) Congrats to you!